At the Primrose/Wolf Lake Project (PAW), Canadian Natural recovers oil through a process called Cyclic Steam Stimulation (CSS). 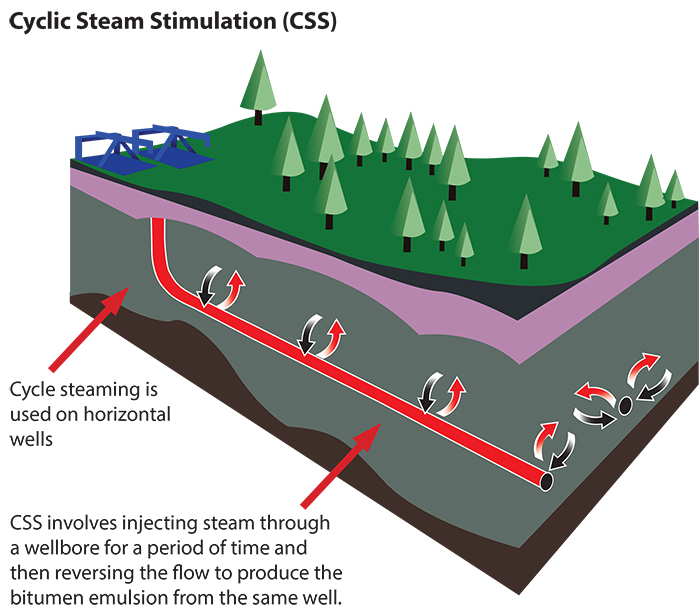 As shown below, CSS involves drilling approximately 500 metres below the surface. At that depth, we are steaming in what is called the Clearwater formation. 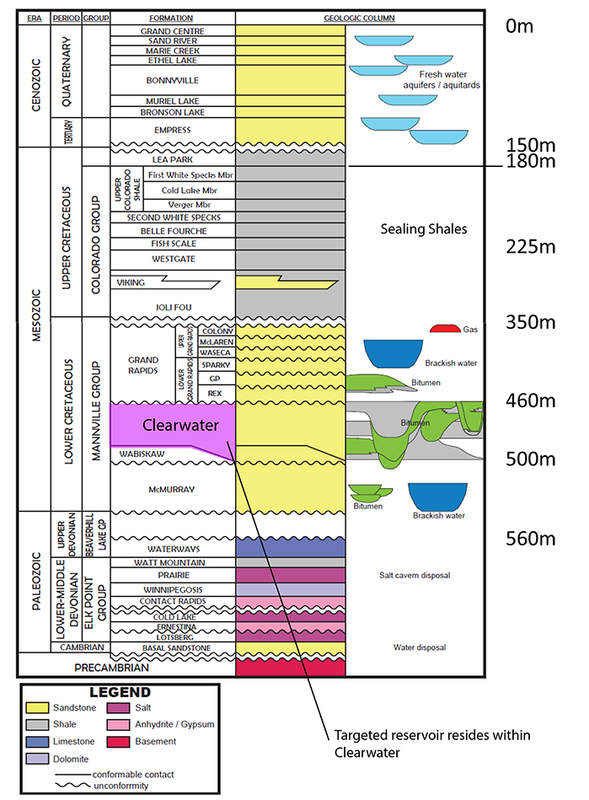 As seen in the geological formations diagram below, Quaternary period layers are found near and at the surface, followed by the Lea Park Formation, and the very thick Colorado Group. The upper layer of the Colorado Group is known as the Colorado Group Shales. Beneath that, the Grand Rapids Formation occurs, which is a layer composed of sand interlaid with shales and is typically filled with brackish water (naturally occurring saltwater). Beneath the Grand Rapids Formation, the Clearwater Formation is found. The Clearwater Formation is essentially a shale and sand layer, which contains the bitumen we recover with cyclic steam stimulation (CSS). Beneath this lies the Wabiskaw and McMurray formations followed by the Paleozoic Era layers. There are three major rock formations that prevent fluids from the Clearwater reaching the surface. These three formations are the Clearwater Shale, Grand Rapids Formation, and the Colorado Group Shales.